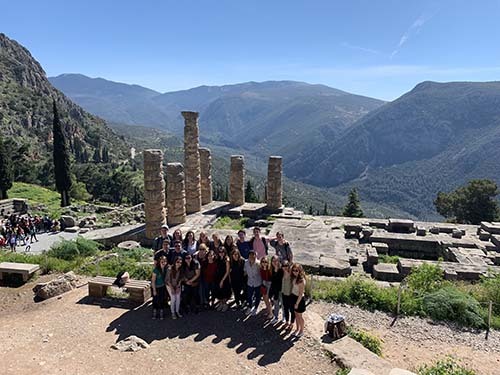 Students visit the ruins at the ancient site of Delphi in Greece, gaining an appreciation and understanding of the ancient cultures. 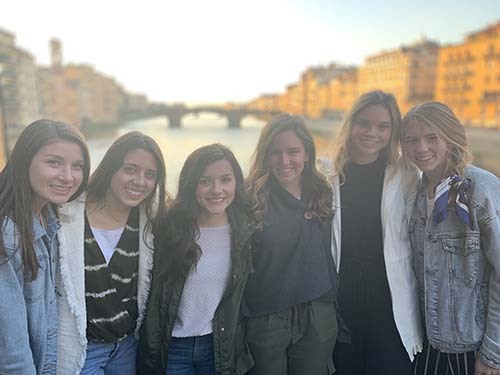 (L – R): S of O seniors Leah Dolloff, Mary Beth Porter, Emily Shafer, Abby Mutrux, Olivia Vinton, and Lucy Watson stand on the Ponte Vecchio in Florence, Italy, taking in the historic architecture and buildings. 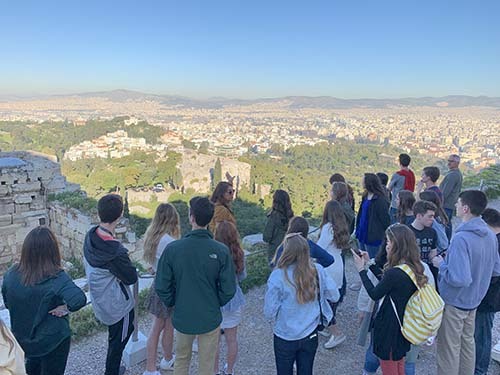 S of O seniors and sponsors view the city from the Acropolis of Athens while Amy Martin, assistant professor of humanities, speaks to the seniors about the city’s significance. Students gather in front of Michelangelo’s David at The Accademia Gallery Museum in Florence. Students stand in front of St. Mark’s Basilica in Venice. 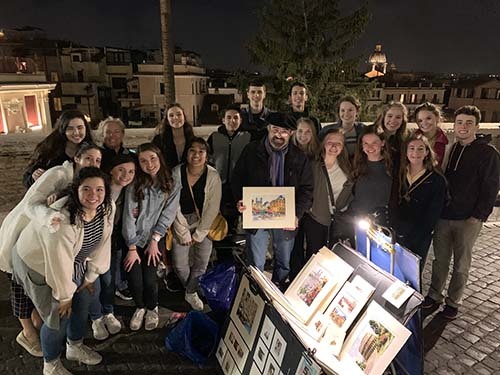 Students stand atop the Spanish Steps with a local street artist during an evening in Rome. POINT LOOKOUT, MO. 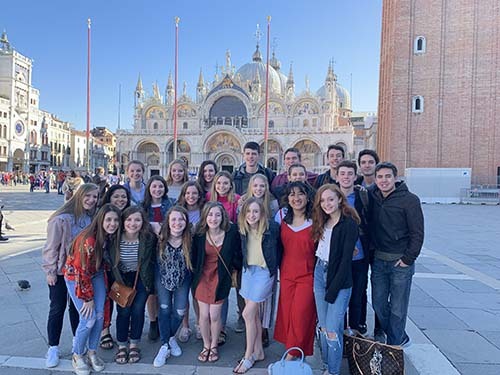 — School of the Ozarks high school seniors recently returned from the School’s annual cultural trip to Greece and Italy. The trip spanned from March 14-24. All 23 seniors ventured to historical sites accompanied by Brad Dolloff, dean of School of the Ozarks, and his wife, Dee; Steve Martin, adjunct professor and S of O chaplain, and his wife, Amy Martin, assistant professor of humanities; and Lisa Herchenroeder, C of O assistant professor of nursing. 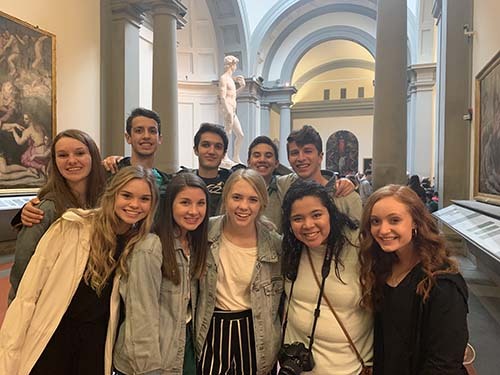 The students visited numerous ancient ruins and historical art museums and tasted authentic cuisine in cities such as Athens, Rome, Florence, and Venice. The seniors experienced the ancient Grecian Acropolis, paid their respects to fallen soldiers in the Florence American Cemetery and Memorial, and water taxied through the canals of Venice. They also visited The Panathenaic Stadium, St. Peter’s Basilica, Vatican Museums and Sistine Chapel, The Accademia Gallery Museum in Florence, home of David, Michelangelo’s sculpture, and St. Mark’s Basilica. College of the Ozarks is a private, Christian, liberal arts college, located in Point Lookout, Missouri, on a 1,000-acre campus. Christian values, hard work, and financial responsibility comprise the fundamental building blocks of the “Hard Work U.” experience. The College earns numerous accolades yearly, including No. 1 Most Innovative School in the Midwest by U.S. News & World Report for 2019 and No. 1 Best Bang for the Buck by Washington Monthly. To achieve its vision, the College pursues academic, vocational, Christian, patriotic, and cultural goals. These goals are mirrored in School of the Ozarks, a laboratory school that completes the K-college model. The Keeter Center — the College’s award winning lodge, restaurant, and conference facility — was ranked a Top Small Hotel in the U.S. by TripAdvisor for 2018. It features historic lodging, fine dining, and meeting rooms. With more than 350 student workers, it is the largest workstation on campus. Follow College of the Ozarks at www.facebook.com/collegeoftheozarks or on Twitter @CofOHardWorkU.